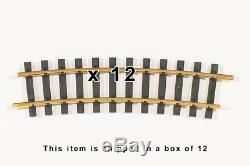 PIKO-35215, BOX OF 12, R5 1240MM RADIUS CURVE TRACK, 48.8R G SCALE or ONE (1) Gauge. R5 Curve: Radius = 1240mm / 48.8. Diameter = 2480mm / 97.6. Each 35215 curve is 15°. 24 pieces completes a circle. Code 332 (0.332 high) solid rail. Ties are made of ultraviolet-stabilized HDPE. Unique track geometry makes even complex track plans simple to build with only a few different track sections. Compatible with most other brands of G-Scale track for unlimited expansion possibilities. Sturdy push-together rail joiners are factory-formed to fit tightly to the rail profile. Made in our own factory in Germany. For best results outdoors, use PIKO RailClamps. The item "PIKO 35215, R5 Curve Track R=1240mm, 12 Pieces of G Scale / One Gauge Track" is in sale since Thursday, May 24, 2018. This item is in the category "Toys & Hobbies\Model Railroads & Trains\G Scale\Track". The seller is "vztech" and is located in Taunton, Massachusetts.